Season 4 Team Fishing League sponsored by MogulWood will begin registration next week! Stay tuned for more info! Season 4 registration opening soon! Season 4 reg will be available in the coming days! Stay tuned to the website for more details! Season 4 is sponsored by our newest game MogulWood! MogulWood is a multiplayer movie trivia and studio simulator HUD game for Second Life! Create your own movies and run your studio with your friends! For more info click on the link above or on the side! 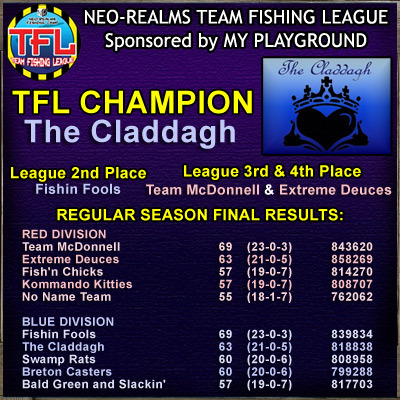 CONGRATS TO THE CLADDAGH, CHAMPIONS OF SEASON 3! Season 3's winner is The Claddagh! Congrats to Gabe Fitzsimmons and Alicia Czukor! Thank you so much everyone who participated in Season 3! Hope you all had a lot of fun! A Season 4 (mini-season with 4 divisions and less games) may be just around the corner, so keep an eye out in this space for more details! Once again a very special thanks to our league sponsor MY PLAYGROUND, and our platinum sponsors: The Metaverse Messenger, Club McDonnell, Valentines Island, Club Extreme, Val's Recreation Center, and Halberd Images! Final Results and Prizes tomorrow! The results of the championship will be available tomorrow! Also all winning teams will get their prize money and awards. A very special thanks to our league sponsor MY PLAYGROUND, and our platinum sponsors: The Metaverse Messenger, Club McDonnell, Valentines Island, Club Extreme, Val's Recreation Center, and Halberd Images! TFL Semi-Final Results, Final Match This Week! 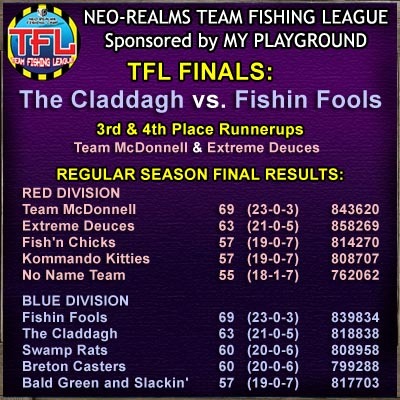 The Claddagh defeated Team McDonnell and Fishin Fools outscored Extreme Deuces to create an all Blue Division final! Best of luck to both remaining teams!